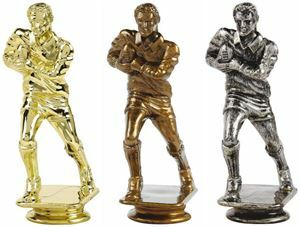 At Impact Trophies & Medals we offer a fantastic selection of figure top trophies for rugby. Available on a choice of colourful column bases, our figure tops range includes rugby players, rugby ball and logo insert figure tops for your your rugby club presentation. Impact Trophies & Medals are a leading retailer of figure top rugby trophies. 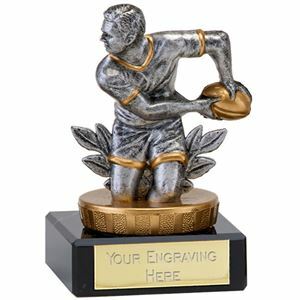 Great for awards on a budget, our figure top rugby trophies can be personalised with FREE self adhesive engraved text plates as well as many allowing space for you to display your printed logo insert. The Rugby Trophy Figure Top is a high quality plastic figure top displaying a male rugby player running with a rugby ball tucked under one arm. 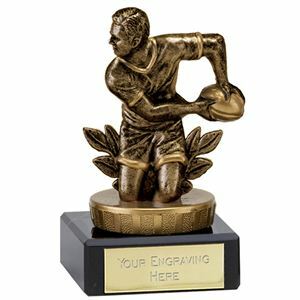 Making a break for the line, this rugby figure top is available in a choice of gold, antique gold and antique silver finishes, allowing you to create a trophy that will meet your presentation needs. This rugby figure is compatible with a range of trophy bases(sold separately), with an easy screw fixing at the base of the figure top quick assembly. 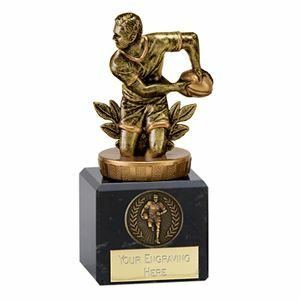 Displaying a gold male rugby figurine, complete with rugby ball, this small premium plastic trophy is set on a black trophy base. The Classic Flexx Rugby Trophy - Small is set on a gold circular platform with golden grain detailing. 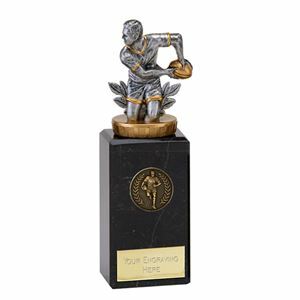 Made from premium plastic and set on a small black base, the Classic Flexx Rugby Silver Trophy - Small is the perfect small award for any rugby achievement. The trophy featured a silver statue of a rugby player holding a golden rugby ball. Made from a premium grade of metallic glazed plastic, this attractive award would make a desirable trophy for any rugby event or prize giving ceremony. The golden figure top represents a rugby playing figure, holding the ball in a running pose and sits on holographic effect foil coated column which can be supplied in your choice of colour from our range. The Rugby Figure Top Trophy comes mounted on a solid marble plinth. 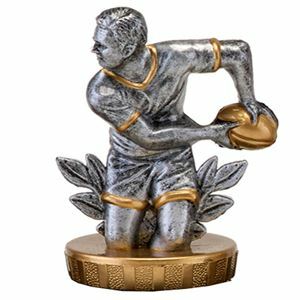 Made from premium gold coloured plastic, the gold Classic Flexx Rugby Trophy shows a male rugby player looking to pass a ball. The Flexx figure top remains the same size (70mm), with the difference in height coming from the marble base, which is available in 3 sizes (50, 75 and 100mm). The Classic Flexx Rugby Silver Trophy displays a plastic figurine of a male rugby player passing a golden rugby ball. The trophy figure is set on top of a circular golden platform which sits on a black marble base. The plastic figure top stands at 70mm tall, with the base coming in 3 different heights (50, 75 and 100mm). The Gold Sundae Rugby Trophy proudly showcases a large model of a rugby ball on top of a glossy golden base. 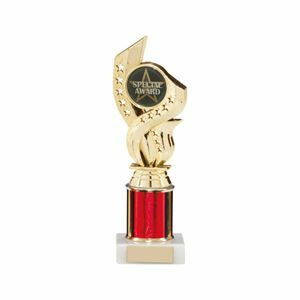 This premium plastic trophy has been formed to resemble a sundae glass and is lacquered in a gold glaze. 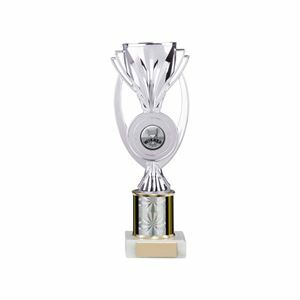 Mounted on a square marble base, this item is offered at a great low price in packs of just 12 trophies.